This seems to confirm the saying that ‘what a man co do, a woman can do better’. 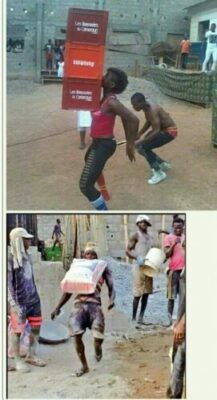 If a man can carry a bag of cement with his teeth, a woman can carry 3 crates of drinks with her own mouth aided by her breasts (“battle of supremacy” . This woman was spotted displaying her rare talent at an event.